Pizza- you can grow that! Well, not the whole pizza, there’s no such thing as a sausage tree or a mozzarella bush, after all, but we do veggie pizzas around here, mostly, and it is certainly possible to grow your herbs and veggies for pizza. I have an oregano plant that has come up reliably for five years. I always swoop down and brush it with my fingers when I walk past, just to smell that evocative scent of …well…pizza. You can plant onion sets simply by pushing them into the soil, pointy end up. Pull them throughout the summer for green onions. Wait until after danger of last frost to plant tomatoes, peppers and basil. In my area, that is traditionally mother’s day. This has been a weird year, though, with hardly any snow all winter, then a couple big dumps- one that closed school on May first- this spring. 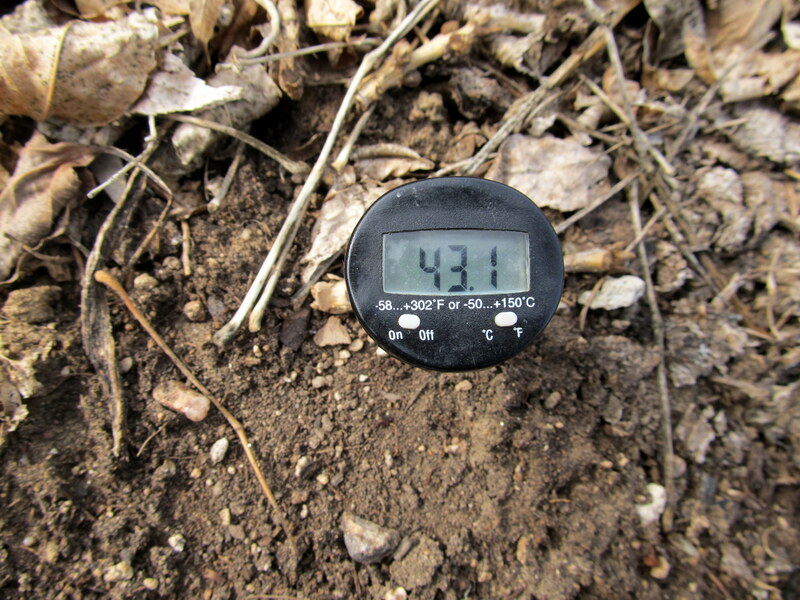 The snow has melted, but the soil is still very cold. I’m going to set up Walls of Water, to warm up the soil in advance of planting. Yes, this is our meat thermometer. Yes, I washed it! 43 Fahrenheit is around 4 degrees Celsius. Tomatoes are happier with warmer toes. I have designed my garden on purpose to mix in edibles with the flowers. Rather than having a big “vegetable garden” out back, each big border has an area without perennials or bulbs that I can turn over and plant annual vegetables. I think it is prettier, and easier to take care of, to have a couple of square feet of tomatoes right next to the asters and iris. Previous Mistakes in Scale Next What is your deal, Asparagus? Santa Monica Pizza & Pasta Co.
Reblogged this on Santa Monica Pizza & Pasta Co..